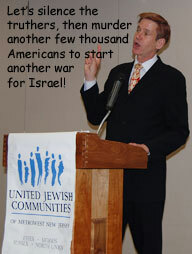 WINEP, like AIPAC, is a criminal organization – a viper’s nest of unregistered agents of a foreign power. Even if they weren’t advocating mass murder and high treason, and calling for the silencing of opposition to the 9/11 coup they and/or their fellow travelers helped orchestrate, they should all be arrested and sent to prison. But when they cross the line and advocate the mass murder of Americans to trigger a war for Israel that could easily become World War Three…well, I’m not sure what method of execution could suffice. They call it “Near East Policy.” I call it high treason and conspiracy to commit mass murder.